It's been said many times before, but Huddersfield is a most unlikely location for what is probably the UK's most distinguished and longest-running contemporary music festival. With a population not much over 160,000, and offering great views of the West Riding of Yorkshire even from the town center, the general population is more likely to associate it with Harold Wilson, James Mason, rugby league (all born there, Wikipedia informs me), or the industrial revolution. But for a certain group of contemporary music enthusiasts names such as Helmut Lachenmann, Irvine Arditti, or Philip Thomas will spring to mind more readily when the town is mentioned. In this Huddersfield is not so different from Darmstadt, a town of a similar size that to most Germans, I suspect, connotes industry, science, and technology much more than it conjures names like Boulez, Stockhausen, or Nono. That this is the case probably tells us something about the peculiar situation of contemporary composition, as true early in the twenty-first century as it was in the mid-twentieth: equally reliant on publicly-funded institutional support and the passionate enthusiasm of a relatively small group of aficionados. There are of course tensions between conservatism and change even in situations (like contemporary music) where one might hope that the emphasis would fall naturally on change. There's nothing too surprising in this: the efforts to establish a certain platform and achieve a level of respect for a new form are frequently so demanding, and require so much continual labor to defend, that we should not be too astonished if this defense sometimes morphs into a neo-conservatism. And of course nobody wants running a clean bath to be achieved at the expense of chucking out the infant sat in it, even if the water has become cold and murky. So Graham McKenzie, who has been artistic director of the Huddersfield Contemporary Music Festival (HCMF) for ten years now, is to be applauded for the course he has steered between the old new and the new new. 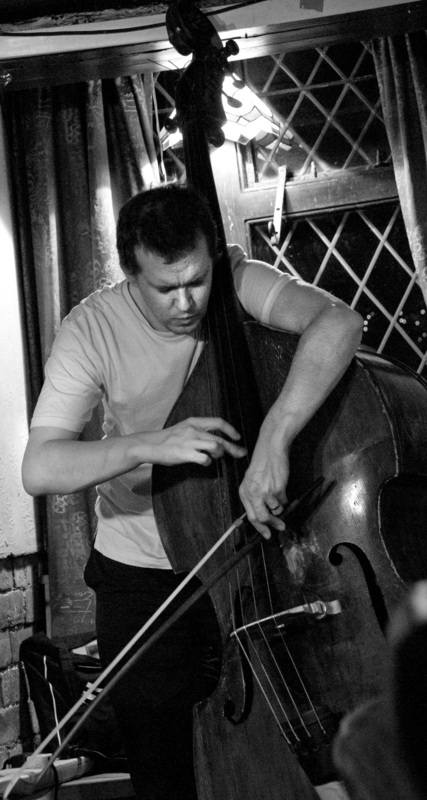 I am a double bassist who came up in a scene of improvisers in Oxford during the first decade of this century. I still do a great deal of improvising, but over the last five or six years I've also become increasingly active in the contemporary composition world, in what the saxophonist and composer Anthony Braxton would describe as the "post-Cage continuum." This has included playing a lot of music by—and with—the members of the Wandelweiser composers' collective and the musicians associated with concert series such as Music We'd Like to Hear in London. So it was in this latter capacity that I was invited to perform at last November's installment of the Huddersfield festival. I'd performed at the festival in rather minor contexts twice before, but this time I had the pleasure of a more extensive contribution involving three different solo double bass performances, one of them part of a concert broadcast live on BBC Radio 3. I was only able to attend the festival for three days, most of which was occupied by activity related to the concerts I was participating in, so what follows is in no way an overview of or even a reflection upon the festival itself as a whole, but rather some personal musings about my experiences and the thoughts they gave rise to. All of the Wandelweiser composers are also performers, and on a number of occasions I’ve had the privilege of performing their music in groups in which they also perform. Despite the rather large sonic and procedural differences, for me, this process isn't so distinct from group improvisation: there is in a both contexts a strong sense of co-creation, of a mutual responsibility for the music which is based on supportiveness, but that doesn't preclude a healthy dose of tension, whether deliberately introduced or not. My first performance at the festival, however, was a world premiere of a piece for solo double bass written by the Swiss composer, clarinetist, and Wandelweiser group member Jürg Frey. This was a rather different beast: in such a situation one is very aware that successes and failures are more likely than not to be ascribed to the composer rather than the performer, which creates a particular sense of responsibility. I drove up from Bristol on the day of the concert, which was a late-night affair beginning at 11pm. Traffic was heavier than expected so I was a little late meeting Jürg (who I already knew fairly well) to play him the piece for the first time. This necessitated a rather rapid switching of headspaces: from motorway driving to playing an intense, very quiet piece of music for its author in a small, rather anonymous hotel room. Not that I objected to this: the way music can rapidly shift one into a different way of thinking, even a different way of perceiving, is one of its most distinct and mysterious powers. The experience of playing the piece for Jürg was a lesson in the discovery of musical richness. Of course there were technical things to be discussed (bowings, the use of a mute or not), but most important were the imaginative lessons. The piece, Accurate Placement, is fifteen minutes long. For extended sections in the middle of the piece there are long, repeated bowed harmonics, which alternate between being held for three beats and for four beats. Jürg explained how the three beat notes were like a waltz, whereas the whole notes (semibreves, we call them in Britain) represented a square 4/4. A three-beat note—so what, it's a note that lasts three beats, right? A waltz—that's something else entirely, beginning of course with the idea of dancing. Is this something that could be audible in my performance? I'm not at all sure, and I don't think that Jürg intended it as part of my job to make it so, but thinking like this certainly increased the vividness of playing the piece and that, I'd like to think, can't but have made some difference to the audience's experience. Next we headed to the venue for the sound-check and technical run-through of the whole concert: this was to be the live radio broadcast. The venue had changed at the last minute, across the other side of an industrial courtyard from the intended space, because when the late-night concert that had taken place there the day before had finished, the temperature had been something like two degrees. But the new venue, while warmer, was still very far from tropical, and so heaters had to be left on during the rehearsal. They weren't particularly loud, but in music as quiet as Frey's they were nonetheless bound to absorb a great deal of the acoustic energy in the room, so that I didn't get a full sense of how the piece would come across until I was playing it "for real." It was a joy to hear this piece, acerbic and relentless but full of color and personality. But there was also something odd about the general experience, given what I was there to do, which underlined both the rewards and something of the drawbacks of the close-knit nature of new music, with its different mini-worlds. Catching up with all these improvisers was terrific, but there was also a sense that I was hovering between two worlds, playing a different kind of music, to which their response, I suspect, ranged from the intrigued to the skeptical. In the event, because of the desire to minimize shuffling around and setting up between pieces, Ensemble Anomaly set up directly facing the audience, which was arranged in long rows, while I was over to stage right, facing parallel to the rows of chairs rather than directly towards them. This meant that the audience members over to stage left were really a considerable distance away from me. Jürg spoke in his introduction about the way his music was music for the eardrums rather than music for the body, and the setup certainly emphasized this. Because of the orientation of the room it was, in fact, difficult for me to feel a close connection to the audience in the room. The microphones in front of me, though, were a constant reminder of the audience sitting at the other end of the radio waves. So while performing there was a simultaneous sense of absence and of a kind of distanced intimacy, which I don't think I've ever experienced before. The day after the concert I had a day off, so I walked into Huddersfield from my hotel, about three miles in from the ring road, to catch up with friends and hear some concerts. The intimacy and yet divergence of different groups was emphasized once again, as well as my perhaps perverse reaction to it: as lovely as it is to spend time with a group with shared enthusiasms, when an enthusiasm is too unanimously shared I can't help but want to resist it. A case in point was the concert of Jürg Frey's second and third string quartets, immaculately performed by the Bozzini Quartet. The second quartet I know very well but only from recordings, a half-hour-long series of chords at points gently inflected by techniques such as humming or laying a finger gently above the finger stopping the note. The piece has all the virtues of the best kind of minimalism (in a general sense, not the quasi-technical sense that has attached the word to the work of Steve Reich, Philip Glass, and their ilk). The rigorous focus of the piece means that what might seem like "almost nothing" opens up into whole worlds of timbre, drama, and inflection: the distinction between three and four-beat notes in Accurate Placement writ large. The third quartet is a very different beast, and attempts more of a rapprochement with conventional harmony and string quartet timbre. The question was whether it held the balance or stepped too far towards the familiar. Among my acquaintances, the majority view was the former, but I must admit to some sympathy with those who felt the latter. It's actually strangely hard to really discuss music in situations like this: it's fine if the parties to the discussion agree, but if they don't, given the network of friendships and different aesthetic priorities that overlay one's reaction to any given performance, things can get heated and uncomfortably personal very quickly. Something similar happened the next day: after a concert of Derek Bailey's notated music for solo guitar played by Diego Castro Magas on classical guitar and Alex Ward on electric—music I know well from recordings but have never heard performed live—I said to a friend who'd also been at the concert, "Wasn't that great?" only to be met by a noncommittal grunt. Which is of course entirely reasonable, but I realized I didn't want to have a conversation about aesthetic first principles at that point, but to just enjoy the memory of the concert. Was that a resistance to having my responses challenged, or was it a reasonable avoidance of a discussion unlikely to have been fruitful at that point in time? It's also important, I think, that festivals like this, with their distinctive mix of intense experiences (whether performing, listening, or arguing) and periods of downtime, also have a dose of the absurd to keep everything in perspective. That was achieved for me by a misreading of the timetable of buses running back from the center of Huddersfield to my hotel, which necessitated making the three mile walk back up the hill late at night after closing time. It would have been chilly at the best of times, but the fact that the zip in my trousers took this opportunity to break meant that it was a distinctly arctic experience... I had to laugh at the ridiculousness of my own stupidity. Plus, I got to see both a fox and a couple of horses, so the experience had its benefits as well. The next afternoon I performed, for the first time, music by Jakob Ullmann. Ullmann, in his late fifties and originally from East Germany, has a formidable knowledge of medieval musics and languages, as well as philosophy. His music is not infrequently discussed in connection with that of the Wandelweiser composers, but the main affinity between them, I think, resides merely in the fact that they all write extremely quiet music. In other ways their approaches can seem almost diametrically opposed. Solo IV is a collection of graphics, transparencies, lines, and so forth, which are used to produce a performing score by following the composer's instructions. Ullmann stipulates that the music should be very quiet (ppppp) but that there should be no silences at all. This makes, as one can probably guess, for an intense and demanding performing experience, not least physically: it makes the performer profoundly aware of the fact that most music has at least some brief moments wherein one can catch one's breath, straighten up, and take stock. Maintaining a single line over half an hour is something else entirely. There had been no opportunity to meet up with Jakob before the day of the concert. He proved to be a very warm and vibrant personality, full of ideas and enthusiasm. I played about half of the piece for him; he had some supportive comments, but also wanted the piece to be louder—after I'd been very careful to ensure it was super-quiet! This presented something of a problem: given the nature of the techniques involved I couldn't just play the piece louder because using greater bow speed or pressure would have risked changing the nature of the sounds produced quite considerably. Had this happened the day before, I could have given it a full run-through or two, experimenting with different volumes and approaches to the instrument. As it was, I had to take a middle path, putting a little more energy into the instrument but not completely changing my approach. The concert took place at mid-afternoon in Phipps Hall, upstairs in the main building of the music department of Huddersfield University. It was packed, with perhaps 120 people in attendance. The performance, for me, was intense but also very enjoyable. Unlike the Frey two days before I had a very clear sense of performing for those people who were in the room together with me. They were extremely attentive and quiet. The music seemed to me, onstage, as occupying more or less the right level: certainly very quiet, but always present. After the concert a number of people were intrigued to see the score, and asked questions about the piece. But others also said that for stretches of the piece they couldn't hear any sound coming from the bass at all! I think for some it was an uncomfortable listening experience; intense, certainly, but not all that enjoyable, which of course was not my intention—nor Jakob's. Others, who had also heard the Frey performance, asked if I ever played any loud music. It didn't really help to explain that at other times I also play extremely noisy free jazz, as well as other things that certainly rack up the decibels. It's not really reasonable to extrapolate from one or two performances about a person's full musical personality; and yet, it's hardly unreasonable, either: what else is there to do? We all make generalizations based on limited samples. Even if we recognize the provisional nature of these generalizations, we can't really avoid them. Perhaps it just reflects my improviser's outlook, that I'm not all that good at separating the music from the performer. Is that a drawback, I wonder? My final performance at the festival was later that night, at midnight, in Scott McLaughlin's Reciprocal Structures. Scott, originally from County Clare in Ireland and now based at the University of Leeds, is a younger composer than the other two whose work I played at Huddersfield. He has a background in rock music and a deep interest in the physicality of sound and performance, grounded in a deep knowledge of the harmonic series. Reciprocal Structures mostly involves playing long tones, selected using both my input and improvisational sense, as well as ideas about tuning, harmonics, pacing, and structure suggested by the composer, in interaction with wonderful moiré patterns generated by projecting light through rotating symmetrical glass sculptures by Shelley James. Both the visuals and the sounds generate interference patterns, constructive and destructive interferences that resonate with one another without either directly illustrating the other. Here again questions of acceptance and intervention arose. Certain bowing techniques with certain pitches will create particular overtones, harmonics, multiphonics, or beating sounds. The approach in this piece is to explore these effects in performance, with a decided outline but without aiming to replicate exactly the same outcome each time. Inevitably, effects that come off during rehearsal do not come off in performance: other things happen. But it is always hard not to feel pangs of regret if something especially juicy that cropped up in the rehearsal decides not to emerge during the concert. Still, it all serves to direct one’s sights towards the next concert—and if a musical performance makes one want to do another one, isn't that really the best thing one could ask for?